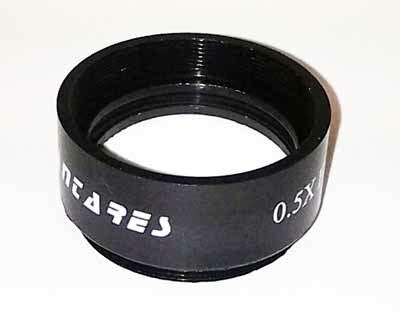 This superb 0.5x focal reducer has been designed to be used with a wide range of modern CCD cameras and eyepieces. The lens has a female 1.25" eyepiece filter thread and can be attached to camera and eyepiece nose barrels to achieve a 40% increase in field of view. Basically the lens has the effect of reducing the focal length of the telescope by 50%. This super quality dual element lens system features fully anti-reflection coating on all air-glass surfaces for increased contrast. The exact degree of focal reduction achieved with any given set-up depends somewhat on the precise position of the FR relative to the imaging chip in the case of CCD cameras and the optics when used with eyepieces. Thus the judicious use of extension tubes and carefully positioned filters can squeeze a great deal of versatility out of these excellent quality observing and imaging aids. Great for visual use and an indispensable CCD imaging aid!